The best-selling production of 'A Little Night Music' is extended and transferred to the West End. Fresh from enjoying a sell-out run at the Menier Chocolate Factory from last November to early this month, the musical, based on Ingmar Bergman's 1955 film, 'Smiles of a Summer Night' and a book by playwright/librettist Hugh Wheeler, with music by American composer/lyricist Stephen Sondheim, will re-open at the Garrick Theatre for another four-month run from March 28th to July 25th. 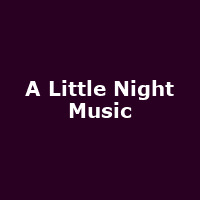 Directed by Trevor Nunn, 'A Little Night Music' is set in early-20th century Sweden, and tells the story of a group of friends and their laborious cycles of romance, where all men have a history with the beautiful but self-absorbed actress Desiree (played by Hannah Waddingham), and all the other women are united in their jealousy towards her. Performances start at 7.30pm Monday to Saturday, with 2.30pm matinees Wednesdays and Saturdays. There's currently a ten-pounds-off (off the top three prices) preview offer for all performances between March 28th and April 4th. Tickets normally cost between £25 (restricted view) and £60.